I was honored to be quoted in an unscientific study about the level of play in the Israel Baseball League during this inaugural season. 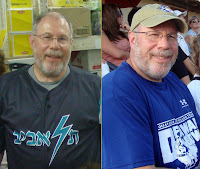 Iblemetrician referenced my subjective impression of the IBL's level of play from a blog entry I posted after watching my first professional baseball game in Israel at Sportek Field. The level of play was somewhere between college ball and AA minor league. -- Rabbi Jason Miller, after attending a game. This Israeli software engineer has a very interesting (and thorough) website dedicated to IBL statistics. Maybe he's trying to become the Michael Lewis (author of "Moneyball") of Israel baseball? A better judge of the level of IBL play would be Jay Sokol (right), who traveled to Israel with me and sat next to me during the Netanya Tigers-Raanana Express game. Jay is the General Manager for the Delaware Cows of the Great Lakes League, which is a summer league dedicated to helping college players get used to the wooden bats they'll use in the minor leagues. Jay thought the level of play in the IBL was very similar to the wood bat summer league. He even recognized an IBL player whom he previously scouted for the Cows. While I was honored to be quoted in this biBlemetrics posting, I was saddened to read in another posting that the Sportek baseball field, one of the three remodeled fields of the IBL, would be returning to its pre-upgrade state. While my "Save Tiger Stadium" campaign didn't seem to work out too well, let's see what we can do about Sportek Field. Honored, huh? I'm just a software engineer, a blogger, and a novice amateur baseball analyst. I searched for comments about the level of play in the IBL, and found yours. I can't vouch for its accuracy any more than you can! Thanks, though, for Jay Sokol's assessment, which would seem to have a bit more substance behind it. Actually, there were other baseball professionals who observed IBL games and no doubt have "expert" opinions of the players, but none of them have passed me any juicy leaks! I should make one more brief point: Netanya and Raanana were among the league's weaker teams (or at least Netanya was for the first half of the season), and their level of play is not fully representative of the league as a whole. In case you were curious, here's the box score of the game you attended, and the play-by-play log.